Through an incomparable blend of bejewelled superiority and mechanical dexterity, Breguet’s master craftsmen have, ever since the beginning, drawn inspiration from prestigious women patrons like Caroline Murat and Marie Antoinette. In sync with its timeless vision and legacy, the horological house honours Empress Josephine — the first wife of Napoleon Bonaparte — with the Perles Impériales Haute Joaillerie watch. A fervent art lover who enhanced the Bonaparte family’s large collection of Breguet models, she had acquired a small tact watch in 1800, which was characterised by a blue enamel case, with diamonds adorning its case band. This high jewellery tour de force is inspired by that piece and echoes the other adornments worn by the Empress. Presenting sophisticated gem-setting techniques, the rose-gold version features brilliant-cut diamonds finely set around the rim of the bezel, accentuated by an additional row of diamonds beneath the prongs, all of which are held in place by delicately crafted gold wires. Replacing the brand’s signature ball-type lug at 6 o’clock is a large Tahitian pearl, offset by the flange set with even more diamonds. 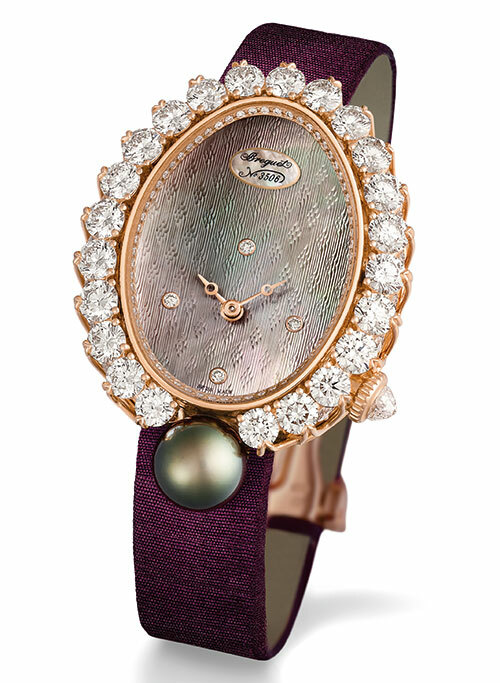 With a Tahitian mother-of-pearl dial working beautifully with a royal purple strap, and four diamond hour markers tipping the total count to almost six carats, this masterwork is definitely worthy of being a girl’s best friend….